I’ve been hunting for an affordable organic milk cleanser that does not contain alcohol and have been quite frustrated with my search. Â I was using Lavera milk cleanser and although I like it, alcohol ranks 5th on the list of ingredients. Â Anyway, I bought it during their clearance sale for a song and now that it is used up, I decided to move on to try new ones. So I finally found one in Juice Beauty. Â The ingredient list is rather long but at least, it doesn’t list alcohols right at the beginning. Â It contains some amount of plant-based alcohols like phenoxyethanol and benzyl alcohol but since they’re listed near or at the bottom, I’m less bothered. Â Anyway, it’s fairly reasonable at S$39 for 180ml and I didn’t mind giving it a try. 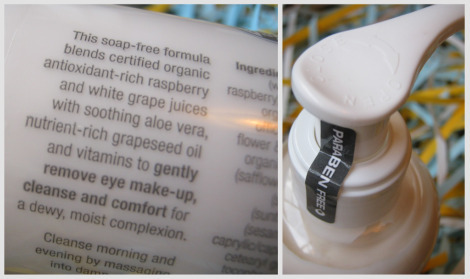 Juice Beauty Cleansing Milk comes in a plastic pump bottle. Â The pump seems a little faulty at times but otherwise, it is functional. Â One pump is sufficient to cleanse the entire face. Â I was told this is good enough to remove all makeup, include those on the eye with the help of a cotton pad. Â It’s true because there were still slight remnants of my eye makeup when I just used my bare fingers. Texture wise, this cleansing milk is rather thick and of course it doesn’t foam. Â I like the fact that it doesn’t leave my face dry as my original intention was to use this prior to my foaming wash. Â You can of course use it by itself if you like as this doesn’t leave the skin sticky or greasy. And come to think about it, I actually like using this more than using oil cleanser because of how my skin feels afterwards. The only plus point about using cleansing oil is that it removes eye makeup more effectively. Okay, something irks me about the Juice Beauty Cleansing Milk. Â The smell is so strong! Â When I first used it, I thought I was applying some chilli on my skin, except that this doesn’t stink. Â Seriously, I cannot smell any raspberry, grape, aloe vera or calendula – it smells totally like chilli. organic juices of vitis vinifera (white grape) juice, rubus idaeus (red raspberry) juice & aloe barbadensis leaf juice, organic botanical extracts of calendula officinalis flower, matricaria chamomilla flower & tilia europea (linden) leaf, glycerin, organic plant oils of carthamus tinctorius (safflower) seed, prunus amygdalus dulcis (sweet almond), helianthus annuus (sunflower) & sesamum indicum (sesame), vitis vinifera (grape) seed oil, caprylic/capric triglyceride, cetearyl alcohol, cetearyl glucoside, tocopheryl acetate & tocopherol (vitamin E), sorbitan stearate, retinyl palmitate (vitamin A), phospholipids, ascorbyl palmitate (vitamin C), tetrasodium EDTA, panthenol (vitamin B5), allantoin, phenoxyethanol, xanthan gum, benzyl alcohol, potassium sorbate, citric acid, limonene, linalool, citrus aurantium (sweet orange & orange blossom), anthemis nobilis (chamomile) & boswellia carterii (frankincense) pure essential oils. Like I mentioned, I don’t really like the long list of ingredients. Â I really think organic products should be made simpler so that those with sensitive skin have lesser worries. Â Anyway, there are some ingredients within this Juice Beauty Cleansing Milk that maybe of some concern when it comes to toxicity and possible irritations or allergies. Â These include tocopheryl acetate, benzyl alcohol, phenoxyethanol, limonene and linalool – but since all of these are listed nearly at bottom and so I’m not really bothered. One thing I noticed however, is that this Juice Beauty Cleansing Milk only carries a logo stating that it’s made with certified organic ingredients; it doesn’t state certification by any bodies. Â When I checked the website, it looks like only certain products under their range are USDA certified and this particular one doesn’t fall in that category. Â So I’m quite hazy about the certification for this product. I find the price fairly reasonable for this product, given that it’s S$39 for a 180ml. Â I only need one pump to cleanse my face and I estimate the bottle should last me awhile. Â The scent is something that bothers me a little but otherwise, it’s an effective cleanser for me. Â I don’t use much makeup except for foundation mostly and this cleanser can take them away well. Â In addition, this is not my main cleanser as I still use a foaming cleanser after using this so my only concern is that it shouldn’t leave my skin drying – which this doesn’t. I’m not really hot about repurchasing this item again but if I can’t find something better or it’s attractively discounted, I probably might. 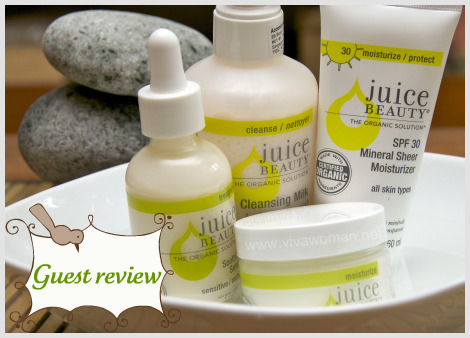 I am surprised Juice Beauty cleansing milk still falls under my $40/bottle cut-off for makeup removers. haha, but it’s on the high side. I will never spend more than $40 on MU removers. So strange that it smells like chili. hahaha. I also having the same problem as you, it is pretty hard to find cleansing milk without alcohol and mineral oil. Unforunately i got no choice but to stick to loreal cleansing milk and pond cleansing milk (both contain mineral oil) while looking for better alternatives. I suppose it depends on personal threshold. Before this, the Lavera milk cleanser only cost me a couple of dollars due to the clearance sale… But I wanted a change and also to try Juice Beauty’s stuff too. Hi! I was looking for one too and found Aubrey Organics #5 for oily skin. It has made a tremendous difference in my skin, everytime I deviate, I go back. I think I will try the one for sensetive skin because my skin is starting to normalize rather than being so oily. You’re right that this formula is better for oily skin. The ingredients in there certainly does work for most people with dry skin. I think most people prefer to using a foaming cleanser after using a cleansing milk or even an oil cleanser. But this alone will probably work for those with very dry skin. I have tried alot of different natural cleansers. The one I currently use is the best I have ever tried, and it works for all skin types. It uses soap berries as a non soap, non drying very thorough cleanser. It takes off all my makeup, and leaves my skin feeling much more balanced. I wear less makeup now because it has improved my skin texture that much. I’ve been using it for 6 months. The company is called In Love with Bodycare. they have a website by that name. and the cleanser is called in Love with your complexion, facial cleanser. You spray it on and wipe it off, super simple. I highly recommend it. I’m a huge fan of Juice Beauty and their Cleansing Milk. I put some on my eyes and rub it off dry for a make up remover and then cleanse my face afterwards with it. Foaming cleanser doesn’t necessary leave our skin tight if they do not contain SLS. I’ve used a number and they all leave my skin soft and supple. But yes, I agree it’s in the mind when it comes to milk cleanser vs foaming cleanser. I tried Juice Beauty Cleaning milk and wasn’t very impressed. Lately I’ve been using Terressentials facial cleaner and toner, the non-fragrance ones (cheeper). what’s your opinion about terressentials? Organic aloe vera juiceÂ°, organic olive oilÂ° castile soap, organic extractsÂ° of organic calendulaÂ°, organic altheaÂ°, organic alchemilla (lady’s mantle)Â° and organic curcuma longaÂ°. Never tried Terressentials but the ingredients look good. Chilli face cleanser? Think I vaguely recall reading it somewhere…can’t remember now. But…yikes! I love their lip treatments, although its quite expensive for the size. I’m using ‘naturally yours’ cleanser which has green tea and olive oil, etc. I cost me just under $12 for decent size bottle which lasts me for ages. The lady who makes it is so sweet, she lives local to my house and gave me a bunch of samples!!!! Hi Sesame, are you still using Juice Beauty cleansing milk? Where can I get this in Singapore? No, I don’t use it anymore. I still have half a bottle left. I got it from Sephora. I stopped because I was having acne issues and I figure that foaming cleansers worked better for me. I find that I need to have both cleansing milk and cleansing foam to remove my MV sunscreen. Can you recommend any good one? Do you have the brand BOD from where you are? It’s an Australian brand and I’m using their cleansing gel now. Haven’t tried the cleansing milk though. Another brand you can look out for is A’kin. I love their sandalwood foaming cleanser. I actually just double cleanse with a gentle foaming cleanser after using the sunscreen. It’s not drying for my combination skin. Btw, how’s the sunscreen working for you? I like the sunscreen because of the effective ingredients. In terms of texture and finishing, MV sunscreen might not be the best but I can’t find any other better natural sunscreen in the market. I also use their Anti Aging Oil + which I really love. I’ve been using this for the last 2 weeks and I no longer have any clogged pores! I think I saw BOD products at Watson’s. I shall check it out. Do you prefer A’kin or BOD cleansing foam? Have you tried Avalon and Sukin as well? Oh I’m glad it’s working all right for you. I agree that compared to some of the chemical sunscreens, MVO’s is not the best but I really like the ingredients very much. And like you, I haven’t come across other natural formulation this good. I’m glad you love the Anti-Aging Oil Plus. I really love it to bits. As for Avalon, I don’t mind the body shower gel but their other skincare stuff seems a bit ‘meh’ to me. And if you look at their ingredients, not too natural. I spotted silicones, a big no no for me. I wanna buy this product now! !